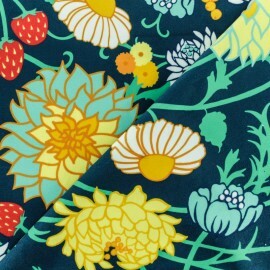 Enjoy this wonderful Chicago short velvet fabric! 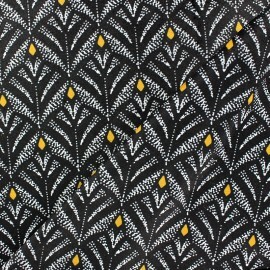 This pretty patterned velvet fabric, with white and mustard graphic patterns, inspired by the 1920's on a black background, will be perfect for your home creations: curtains and accessories like cushions. 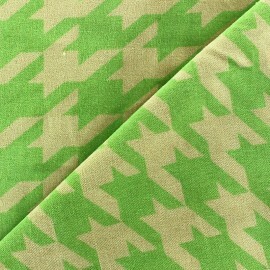 Enjoy this wonderful Palawan short velvet fabric! This pretty exotic velvet fabric, with large jungle and parrots patterns on an off-white background, will be perfect for your home creations: curtains and accessories like cushions. 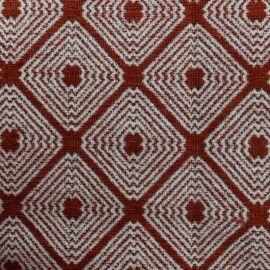 Enjoy this wonderful Palawan short velvet fabric! This pretty exotic velvet fabric, with large jungle and parrots patterns on a peacock green background, will be perfect for your home creations: curtains and accessories like cushions. 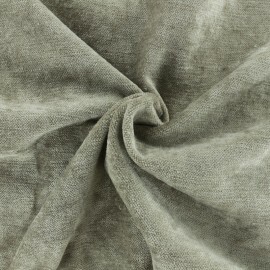 Enjoy this wonderful Janeiro short velvet fabric! This pretty exotic velvet fabric, with large jungle leaf patterns on an emerald green background, will be perfect for your home creations: curtains and accessories like cushions. 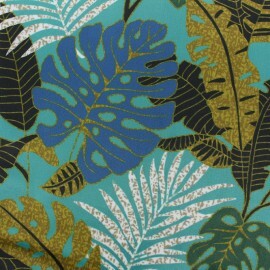 Bring velvet softness into your home with this Exotic leaves digital print fabric with jungle and leaves patterns ! 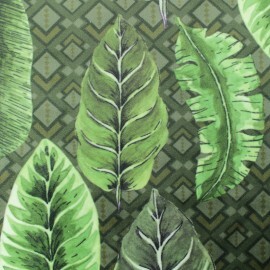 Enjoy these patterns that bring a touch of nature in your decorations and that will dive you in the wild Jungle ! 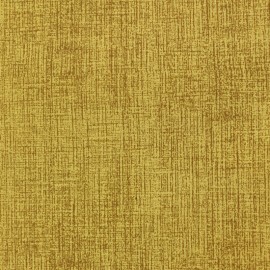 Enjoy this luxury Delhi short velvet fabric! 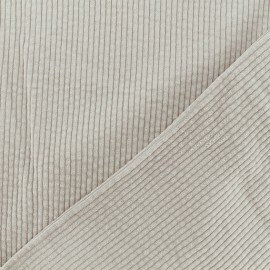 With a beautiful timeless taupe gray color, this high-quality fabric will be perfect to bring warmth and elegance to your home. 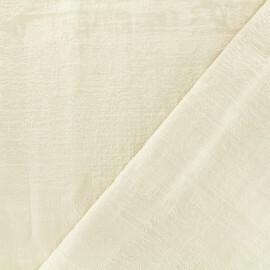 Large width (280 cm), softness and brightness are ideal for making cushions, curtains and home creations. 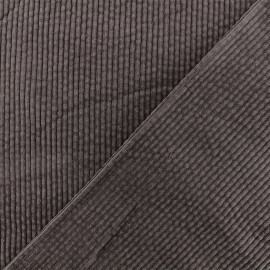 Enjoy this wonderful Janeiro short velvet fabric! 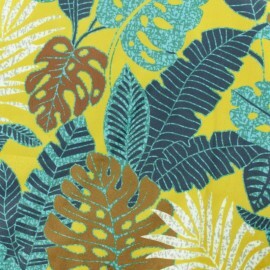 This pretty exotic velvet fabric, with large jungle leaf patterns, will be perfect for your home creations: curtains and accessories like cushions. 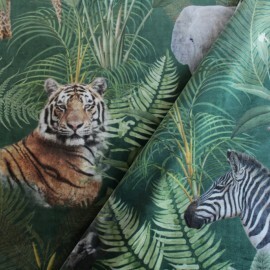 Bring velvet softness into your home with this digital print fabric with jungle and wild animals patterns ! 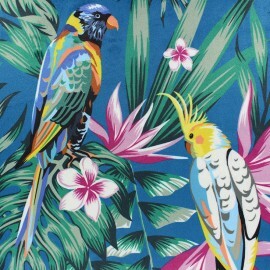 Enjoy these patterns that bring a touch of nature in your decorations and that will dive you in the Burmese Jungle ! 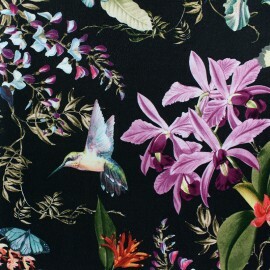 Enjoy this wonderful short black velvet fabric ! This pretty Arabesque velvet fabric will be perfect for your home creations : curtains, accessories like cushions but also clothes.. 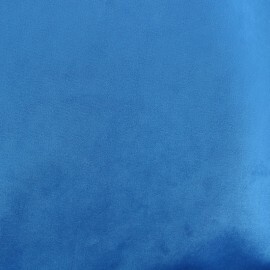 Enjoy this wonderful short blue velvet fabric ! This pretty Laélie velvet fabric will be perfect for your home creations : curtains, accessories like cushions but also clothes.. 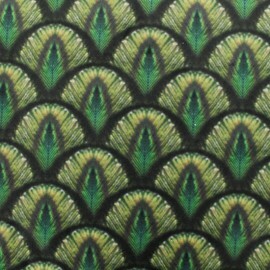 Enjoy this wonderful short peacock green velvet fabric ! This pretty Fraisier velvet fabric will be perfect for your home creations : curtains, accessories like cushions but also clothes.. 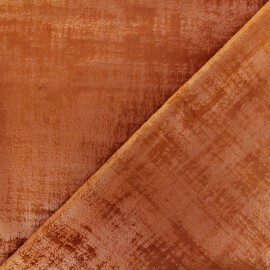 Enjoy our velvet fabric in orange! 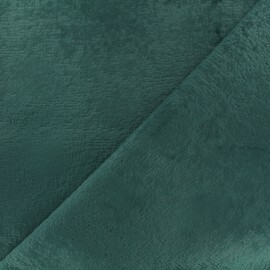 Special furnishing velvet fabric. Resistant, soft and supple, it will be ideal to make or repair your armchairs, seats, sofas. High quality. 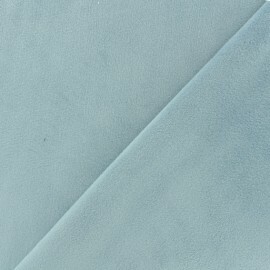 Enjoy our velvet fabric in duck blue! 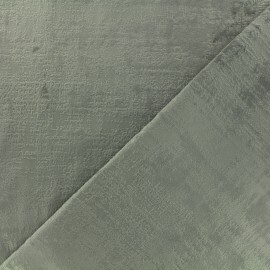 Special furnishing velvet fabric. Resistant, soft and supple, it will be ideal to make or repair your armchairs, seats, sofas. High quality. 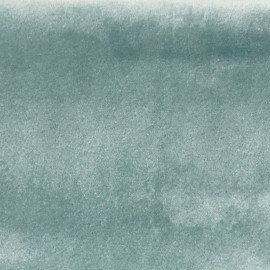 Enjoy this wonderful short double-sided dusty mint velvet fabric ! This luxury Elena velvet fabric will be perfect for your winter creations : for clothes like miniskirt or for home accessories like cushions. 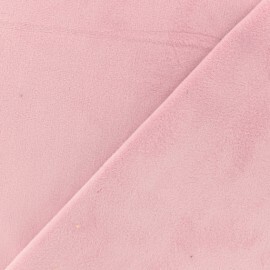 Enjoy this wonderful short double-sided old pink velvet fabric ! This luxury Elena velvet fabric will be perfect for your winter creations : for clothes like miniskirt or for home accessories like cushions. 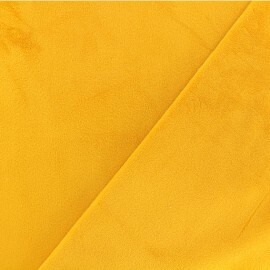 Enjoy this wonderful short double-sided yellow velvet fabric ! This luxury Elena velvet fabric will be perfect for your winter creations : for clothes like miniskirt or for home accessories like cushions. 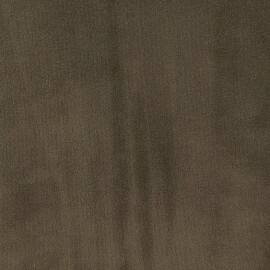 Enjoy this wonderful short double-sided dark grey velvet fabric ! This luxury Elena velvet fabric will be perfect for your winter creations : for clothes like miniskirt or for home accessories like cushions. 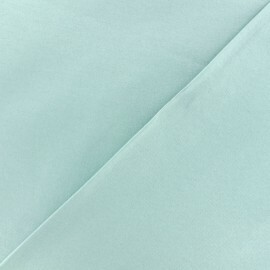 Enjoy this wonderful short double-sided sky blue velvet fabric ! This luxury Elena velvet fabric will be perfect for your winter creations : for clothes like miniskirt or for home accessories like cushions. 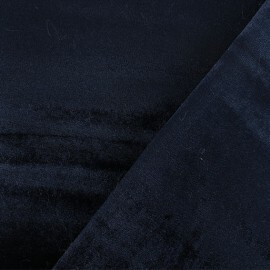 Enjoy this wonderful short double-sided dark blue velvet fabric ! This luxury Elena velvet fabric will be perfect for your winter creations : for clothes like miniskirt or for home accessories like cushions. 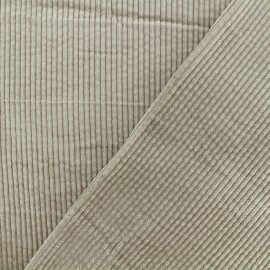 Discover our beautiful beige velvet fabric Milan.Special furnishing fabric, it is very resistant, soft and supple, it will be ideal to make curtains, cushions, etc.Find all our curtains accessories. Discover our beautiful natural velvet fabric Milan.Special furnishing fabric, it is very resistant, soft and supple, it will be ideal to make curtains, cushions, etc.Find all our curtains accessories. Discover our beautiful sienna velvet fabric Milan.Special furnishing fabric, it is very resistant, soft and supple, it will be ideal to make curtains, cushions, etc.Find all our curtains accessories. 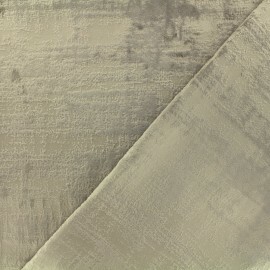 Discover our beautiful taupe velvet fabric Milan.Special furnishing fabric, it is very resistant, soft and supple, it will be ideal to make curtains, cushions, etc.Find all our curtains accessories. 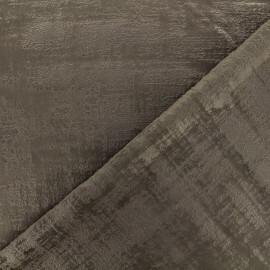 Discover our beautiful pearl grey velvet fabric Milan.Special furnishing fabric, it is very resistant, soft and supple, it will be ideal to make curtains, cushions, etc.Find all our curtains accessories. Discover our beautiful gold velvet fabric Milan.Special furnishing fabric, it is very resistant, soft and supple, it will be ideal to make curtains, cushions, chairs, etc.Find all our curtains accessories. 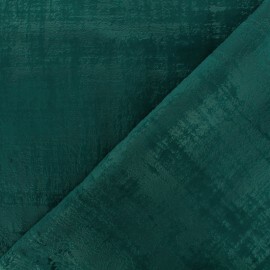 Discover our beautiful peacock blue velvet fabric Milan.Special furnishing fabric, it is very resistant, soft and supple, it will be ideal to make curtains, cushions, etc.Find all our curtains accessories. Discover our beautiful chocolate velvet fabric Milan.Special furnishing fabric, it is very resistant, soft and supple, it will be ideal to make curtains, cushions, etc.Find all our curtains accessories. 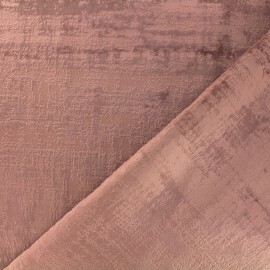 Discover our beautiful velvet fabric Milan ancient pink.Special furnishing fabric, it is very resistant, soft and supple, it will be ideal to make curtains, cushions, etc.Find all our curtains accessories. 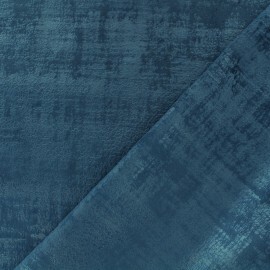 Discover our beautiful velvet fabric Milan blue night.Special furnishing fabric, it is very resistant, soft and supple, it will be ideal to make curtains, cushions, etc.Find all our curtains accessories. Enjoy our Brunei velvet fabric in blue! 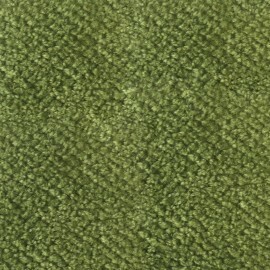 Special furnishing velvet fabric. Resistant, soft and supple, it will be ideal to make or repair your armchairs, seats, sofas. High quality. 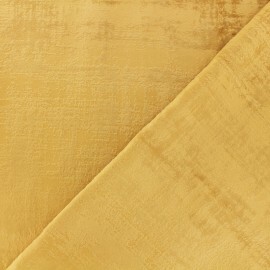 Enjoy our Barein velvet fabric in amber yellow! 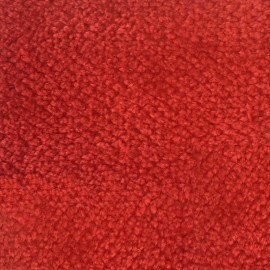 Special furnishing velvet fabric. Resistant, soft and supple, it will be ideal to make or repair your armchairs, seats, sofas. High quality. 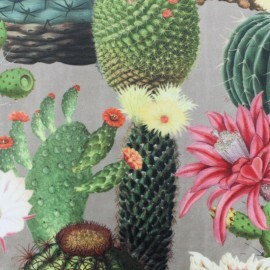 Bring velvet softness into your home with this digital print fabric from the exceptional B & B Fabrics brand! Enjoy these patterns that bring a touch of nature and that will give you the impression of being outside! 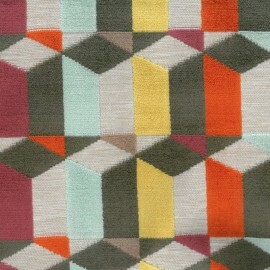 Beautiful colorful jacquard fabric with seat quality. 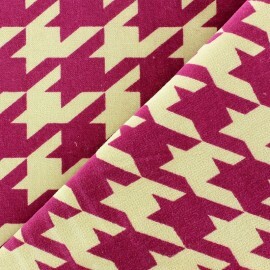 Cover seats, make curtains, cushions and many other accessories with this jacquard fabric with graphic velvet shapes! Decorated your interior or your clothes with jacquard, a weaving effect in which patterns are not printed on the fabric but woven. 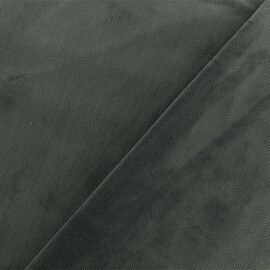 Among our large selection of upholstery fabric, our velvet upholstery fabric is timeless and chic. 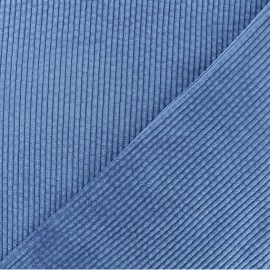 100% cotton, polyester, Oeko-Tex certified or with spandex (elastane), our velvet fabric is versatile, supple and strong. You fancy bright colours? Do you enjoy thick fabrics? 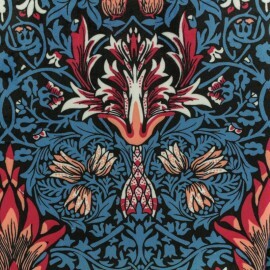 You desire different patterns? Ma Petite Mercerie will become your place to shop! With an important collection of colours, you surely will find your perfect velvet fabric. From green, pink, yellow, orange, and black, to red and white. Also, you will be able to choose the pattern you want, from quilted and herringbone to corduroy and jacquard. Want to buy but not sure what colour or pattern? 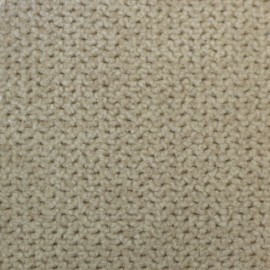 Order a fabric swatch prior ordering the needed amount. Once you are sure about the quantity, you can either buy by the meter, by the yard and so forth. Use your sewing machine and let the magic happen. Even with a few sewing notion, you can create amazing pieces. Make blackout curtains and get a better insulation since it is a thick cloth. 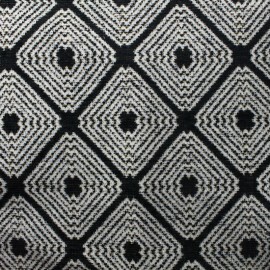 Depending on the yardage you choose, you can create curtains and add a blackout lining with our decorative weave cloth. 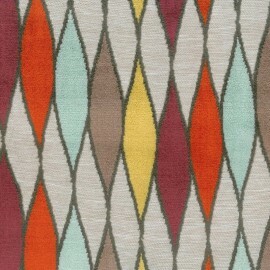 Choose our chevron garment, and refurbish beautiful chairs and design stools. Prefer our large width pane velvet for a pouf. Sew elegant cushions and home decor accents with our heavy weight velvet and discount fabric. Add a luxurious touch to your living room or bedroom by stitching embroidered velvet toile ottomans, folding beds, nightstands, storage benches and more. Purchase an old panel headboard and reupholster your piece for your bedroom. Refurbish a loveseat for your patio or dining room. Furthermore, our novelty velvet drapery is versatile and easy to sew with a 90 or 100 needle and cotton threads. Discover as well all of our other furnishing fabrics: quilted fabrics, faux leather upholstery fabric, velvet, cork, foam, blackout fabrics, faux suede, cotton cloth, oilcloth and so forth.